Agriculture is the #1 industry in Pennsylvania. And the largest indoor Ag event in the U.S. —the Pennsylvania Farm Show—has been housed at the PA Farm Show Complex for the last 90 years. 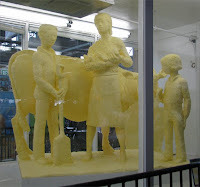 Some main attractions include a life-size butter sculpture and farm equipment displays; competitive events such as livestock judging, cow milking, equine showcase, carriage racing, and sheep-to-shawl; and food contests like B lue Ribbon Apple Pie and Greatest Cocoa Cake. There are also rows and rows of farm animals. Alpacas are my mom's favorite (pho to #2). 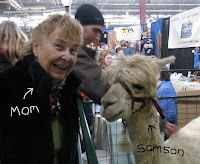 To get a sense of the size of the Alpaca named Samson, my mom measures 13.2 hands at the shoulder. The food court offers local goodies like fresh squeezed milkshakes, funnel cakes, mushrooms, and maple syrup desserts. Not a good place for dieters, only 5 of which reside in Pennsylvania. 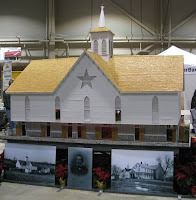 This year, and the sole reason I went to the show (besides the chickens), was a display of a 1/12 scale model of one of the most recognized barns in North America--the Star Barn, c.1872. The star motif represents hope and good fortune for the farm and land. 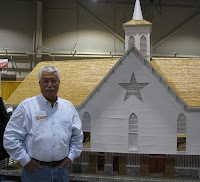 The model builder, Terry Spahr, spent 11 months constructing the exact replica which includes 15,000 roof shingles, real stone, and miniature metal hinges; and the hog & chicken barns and corn crib outbuildings. As luck would have it I was able to talk with Terry, who explained that most of the wood he uses is douglas fir and balsa, and that 2-part cyanoacrylate glue holds the pieces together. He uses 10" and 6" table saws with Piranha saw blades, a band saw, and dremel tool in his shop (among other tools) and builds by the addage "If it's something worth doing, it's worth overdoing it." I can believe it, having seen his work in person. 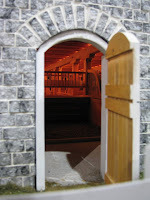 Fully replicated interiors include staircases, stalls, feed bins and if you look closely in the last photo, you will see that the support beams are chamfered. 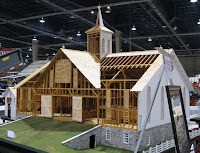 Even if chickens with puffy tresses and bunnies the size of tractors (there's always lots of big hare at PA farm events) aren't your thing, the Star Barn replica makes it well worth the smell of admission.